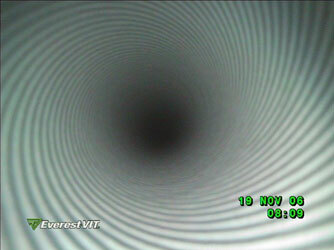 Exchanger restoration using tube ID coating has its origins in a power plant project in the early 1990s. 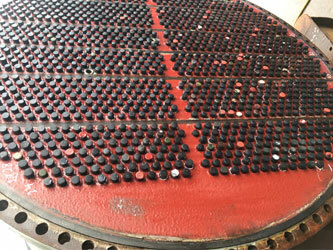 Tube ID coating was successfully used to mitigate unexpected corrosion of a condenser bundle; the restoration was a cost-effective option to a bundle retube and returned generation capacity. Since that project Curran has applied thin film tube ID coating for condenser and heat exchanger tube repair at industrial plants across the globe. Curran International heat exchanger and condenser repair uses engineered polymers, and expert applications to restore exchangers to reliable service. Complete turnkey solutions are designed to inhibit alloy tube fouling, mitigate corrosion and deposit pitting, and provide a barrier to MIC attack. Important to the integrity of tube ID coating application is tube ID cleaning, Curran developed tools and methodology to more efficiently clean full length tube IDs using dry abrasive. Curran can achieve NACE 1 (SSPC-SP5) “white metal” cleanliness down small diameter tube IDs of any exchanger length. Tube ID coating requires that applications be uniform, homogeneous, and pass a holiday spark test to assure coating continuity. Curran has multiple application techniques to deliver high functionality protective coatings to full circumferential ID. Thin film coating applies a protective-inert barrier between the water and reactive substrate; pitted tubes are “repaired” and protected from new corrosion. The Curran tube ID coating method has been deployed for in-situ condenser applications globally, and application systems enable tube ID coating in exchangers with limited work area. Curran can provide installation of tube end ferrules as part of a coating repair of condensers in high velocity, high turbidity water services where a sacrificial alloy repair is needed. Contact Curran about in-service exchanger maintenance and restoration using thin film coatings, tube end ferrules and alloy liners.